Zion Market Research has published a new report titled “Ceramic Sanitary Ware Market by Product Type (Wash Basins, Toilet Sinks/Water Closets, Urinals, Cisterns, and Others), By Technology (Slip Casting, Pressure Casting, Tape Casting, and Isostatic Casting), and By Application (Commercial and Residential): Global Industry Perspective, Comprehensive Analysis, and Forecast, 2018–2025”. 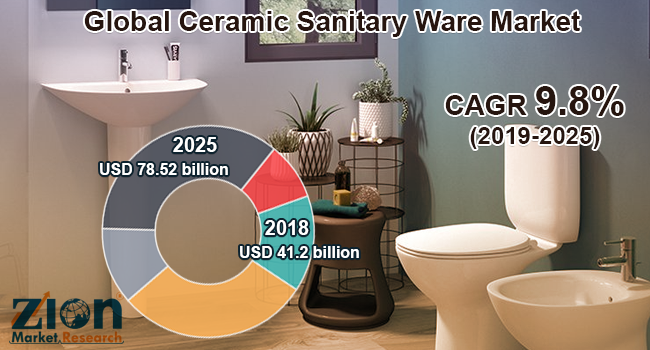 According to the report, the global ceramic sanitary ware market was valued at approximately USD 41.2 billion in 2018 and is expected to generate around USD 78.52 billion by 2025, at a CAGR of around 9.8% between 2019 and 2025. The increasing inclination of consumers toward hygiene and sanitation is fuelling the acceleration of the global ceramic sanitary ware market. Moreover, changing consumer preferences (larger baths, shower systems, saunas private spas, etc.) is providing a new growth platform for the players operating in the ceramic sanitary ware market. The global ceramic sanitary ware market is primarily driven by growing awareness about personal hygiene across the globe. Moreover, the era of capital integration coupled with the increasing demand for sanitary across institutional and commercial sectors, such as colleges, schools, offices, and hotels, are also boosting the ceramic sanitary ware market over the estimated time period. Additionally, proactive initiatives by the government and the ruling authorities to provide affordable ceramic sanitary ware have provided an impetus to this market’s growth. However, variable costs of production and fluctuating demand may restrain the global ceramic sanitary ware market in the future. Nonetheless, the growing awareness about the advantages of ceramic sanitary coupled with increasing investments in ceramic sanitary ware across the globe is likely to open new growth platforms for the ceramic sanitary ware market in the future. The global ceramic sanitary ware market is classified into product type, technology, and application. The global ceramic sanitary ware market is segmented on the basis of product type into cisterns, toilet sinks/water closets, urinals, washbasins, and others. By product type, toilet sinks/water segment is estimated to cover maximum market share in terms of value and volume owing to the fact that consumer uses ceramic sanitary ware mostly for this segment. By technology, the market is segmented into slip casting, pressure casting, tape casting, and isostatic casting. Slip casting is expected to hold the largest market share in the future, due to these castings’ homogenous production, adaptability to complex designs, and low capital investments. By application, the market is segmented into commercial and residential. The commercial segment further includes hospitality, industrial, office and institutional and retail. The residential segment further includes multi-family and single family. The hospitality segment held a prominent market share in 2018 due to the growing traveling industry globally. By region, Asia Pacific dominated the global ceramic sanitary ware market in 2018 and is expected to show the fastest growth over the forecast time period. This can be attributed to the growing awareness about personal hygiene. Europe is the second largest market followed by North America. The Middle East and Africa and Latin America are also expected to experience lucrative growth rates in the global ceramic sanitary ware market in the upcoming years. Some key players of the global ceramic sanitary ware market are LIXIL Corporation, RAK ceramics, Toto Inc., Geberit Group, Roca Group, Duravit AG, Duratex S.A., Villeroy & Boch, HSIL, and Ideal Standard International S.A.